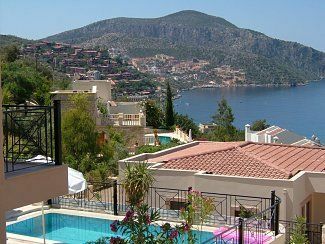 The Safa apartment is situated in Kalkan's 'Old Town'. Conveniently located within a 2 minute stroll of Kalkan’s renowned roof top restaurants and its picturesque beach and harbour. The Safa has been finished to an exceptionally high standard and has been tastefully decorated and furnished throughout. The apartment includes all the facilities you would expect to make your holiday as enjoyable as possible including air-conditioning throughout and Wi-fi internet access. The fully tiled bathroom comprises of shower cubicle, WC and wash basin. The living room comprises of 2 large comfortable sofas, coffee table, CD, iPod and DVD players, and a marble mosaic dining table and 4 chairs. The modern kitchen with granite worktops is fully equipped with a stainless steel hob and oven, extractor fan, microwave, washing machine, fridge/freezer, electric juicer and all the crockery and utensils you will need. Notes on accommodation: A 'meet and greet' service will welcome you to the Safa Apartment. A welcome email will be sent to you prior to your arrival, and if you have any further questions (before or after booking) we are more than happy to answer them. Outside: Safa is a first floor apartment, which is conveniently accessed on ground level through a pretty stone archway and walkway. It is one of 3 apartments that share a lovely pool and sun terrace area, where ample sun loungers and parasols are provided. The apartments main balcony has a table and 4 chairs for your added comfort and enjoyment. Cleaning / Towels / Linen / Maid service: Bed linen and towels are provided. Please bring your own beach towels. Twice weekly cleaning and linen change. Iron and ironing board provided. Other: The apartment has attractive antique marble floors throughout and feature limestone archway in the living area. An excellent property, very well equipped and close to the town. We booked the apartment at short notice and found the booking process easy and stress. Mike and Richard also arranged our transfers and were keen to help in any way. We were appreciative of their help. We were greeted at the apartment as planned and we found it to be perfect for our stay. During our 1 week stay the apartment was cleaned to a high standard and Samat was always available to help. The apartment is perfectly placed near the old town and supermarket. Overall an excellent holiday apartment and excellent value for money. We highly recommend this apartment. Well equipped super apartment in a lovely location. Its an uphill walk back from the beach/harbour front but close to Carrefour. Nice sea view from the balcony where we lived having breakfast snd evening wine/Efes. Hi David, many thanks for the review. Glad you enjoyed your stay. Best wishes, Mike. We would like to thank Mike and Richard for letting there lovely apartment to us, it had everything and more to enable us to have a great holiday. It was our forth holiday in Kalkan, and are going back this year and are booked up for 2015, needless to say we love it. Kalkan itself has an attractive pebble beach that is only a 2 minute stroll away. ‘Kapatus Beach’ is about 10 mins away (by car/taxi/dolmus). This lovely, sandy beach is dramatically located at the foot of a ravine – it is the one used on all the Turkish tourist board ads! ‘Patara Beach’ is about 25 mins away (by car/taxi/dolmus) and is arguably one of the Mediterranean’s most beautiful and unspoilt beaches with 18km of golden sand. The nearest airport to Kalkan is Dalaman airport. We can help arrange a taxi, mini-bus or car hire service for you depending on your requirements. Kalkan is located in the Ancient region of Lycia and many historical sites are relatively close by, including Xanthos, Letoon, Pinara, Tlos and Patara. Kekova, Demre, Myra, Phaselis, Olympos and Aspendos are also within reach, as are the attractive harbour towns of Fethiye and Kas. Kalkan, once a tiny fishing village, is now a sophisticated holiday destination, where yachts sit side by side with gullets and small fishing boats in the picturesque harbour. The selection of high quality restaurants is almost endless, with many tucked away from view on roof terraces or down narrow cobbled side streets. For those who enjoy shopping there is a wide variety (from boutiques to shops selling local crafts, such as ceramics and rugs). All this makes Kalkan the ideal choice for those seeking somewhere a bit different than the average Turkish resort. Booking Notes: Non-refundable deposit is required to secure booking. Balance payable prior to arrival. The apartment is not suitable for persons of limited mobility and may be considered unsuitable for very young children and non-swimmers. Changeover Day: Flexible.